So at work we recently migrated from SVN to Git, and we chose BitBucket as our git host. Some tutorials were written internally about how to get started using git, but since all of the developers have Macs, and I am a Mac user, we wrote the tutorial assuming OS X. It was mostly designed to get used to some of the different concepts of DVCS versus the old Subversion model, and not at all an in depth look at git. If you've used git at all, you know that it is really easy to use in OS X or in Linux. However Windows hasn't been such a smooth story. And finding a good tutorial about getting it all set up isn't really all that easy. To that end, this article is designed to get you up and running using BitBucket and SSH in windows. This article is probably not going to be the best for advanced users. 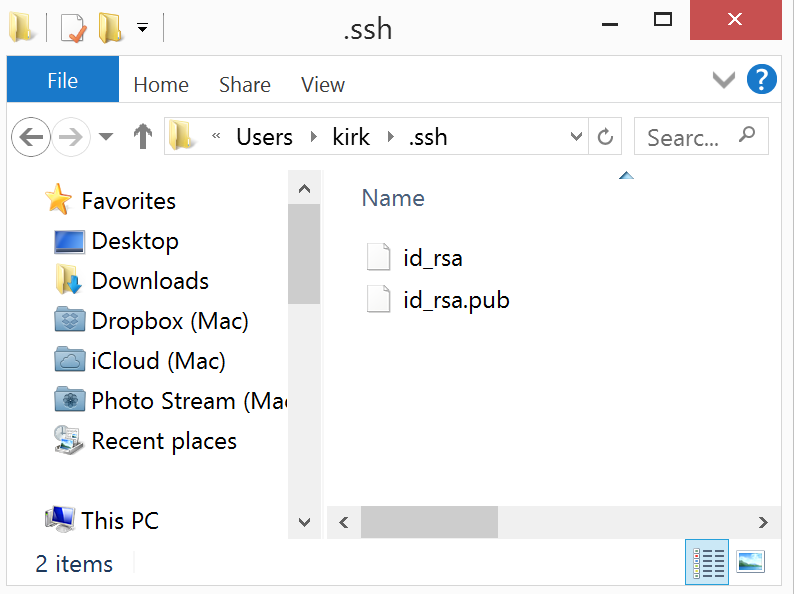 If you know how to create ssh-keys in windows, or already have a functioning Git client running in Windows, then you probably won't get much out of this. Of course, feedback is always appreciated, as I am by no means an expert. In the end, you'll have a functioning install of Git in windows, that will use SSH to communicate with BitBucket. It should work for most other Git implementations that support SSH as well. I'll be using a preview of Windows 8.1 (with Smart8 installed), but the steps should be pretty similar in Windows 7 or newer. If you are using something older than Windows 7, then my advice to you is to get with it and upgrade already. It's worth it. I'm starting with a brand new windows installation. Regardless of what your situation is, I'd recommend that you begin by installing all of your updates, unless you have a damned good reason for not installing them. It might take some time, but it's OK. I'll wait. Now that you're back, you'll want to install Choclatey. In fact, then next time you install windows, you may just want to start with this. If you've ever used HomeBrew in OS X, then you'll probably like Chocolatey. (If you haven't used homebrew and you are a Mac user, then what are you waiting for? Do it. Do it.) It is a basic package manager for Windows. It's dead simple to install. Copy the command on the front page of the website I linked to up there, and paste it into a cmd window or a Run box. It'll do some stuff, and then it'll be done. Once it is done, open a new cmd window in order to get all of the new environmental stuff to refresh. Yep, that's it. Your UAC will probably prompt you about the installation, but once you say OK, Choclatey will finish it's thing, and you should have a fresh install of git. If the output says that git is an unrecognized command (and it might), then we need to update your path. If you didn't get an error, then do cd .git . If that works, then you have a .git directory, & you are golden. Skip the next section (Setting up SSH to work with Git), and feel free to delete that git-test directory. Click OK 3 times, and close your cmd window. Open a new one and re-run that test from above. It should work. I'm not going to get into why you might want to use SSH with git. I'm just going to assume that you do. Seriously, why wouldn't you? Inside your start menu, you should have an item for Git. Inside there you should also find git-bash. Run that bad boy. Once you have a prompt (a friendly looking $ prompt, straight out of war games), run ssh-keygen.exe. This step is going to generate a public and private key pair. It's going to ask some fairly important questions, but I'll walk you through them. In the image below, it is asking where you want to save they key pair. If you know what you are doing, then you can save it somewhere other than in the default installation. Given that you are reading this article, you probably don't know what you are doing, so choose the default by hitting enter. In the next picture, you'll see that you are being prompted for a passphrase. This is a passphrase that is used to unlock your keychain. It should not be your windows password, your git password, or any other password that you use. Make it something long and memorable. By all means, don't make it "I'd really love to get some purple footy pajamas for Valentine's day." But make it something like that. Random is good. Funny is probably more likely to be memorable. Whatever you come up with, you'll need to enter it 2x. Once you've successfully entered your passphrase, it'll spit out some stuff. Not terribly important really. Not for what we are doing here. against your master branch. Protect it. Seriously. Copy the output to your clipboard. Now that you have a public key, it is time to associate it with your account on Bit Bucket. The steps are similar for GitHub. If you really want them written out for GitHub, then post it in the comments. I'll get it done. Start by logging into Bit Bucket. In the upper right, click on your picture and choose Manage Account. 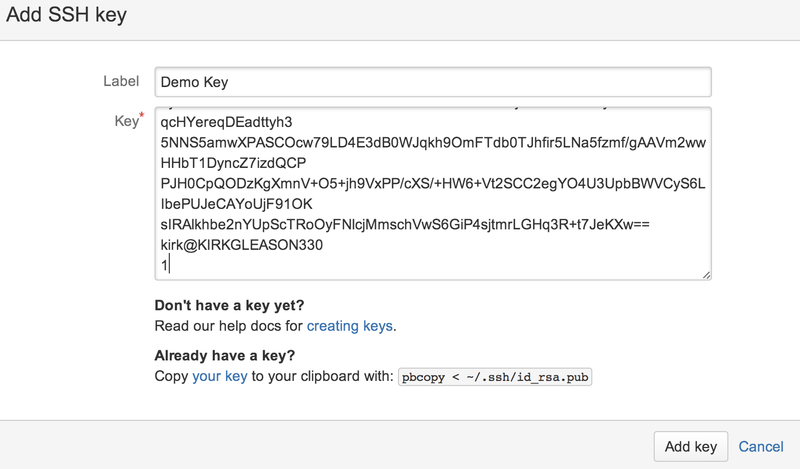 There will be a section called SSH keys. Go there. Hit the "Add Key" button, and put your web browser away for a few moments. Now that the key is in place, we need to give git a little information about you. From here on out, run these commands in a git-bash window. You can thank me for that later. As you may have guessed, the first command will tell git that your name is "Kirk Gleason" and the second that your e-mail address is "kgleason at gmail dot com". Since this probably isn't accurate for you, I'd recommend that you change those values to represent what they should be for you. Set the e-mail address to be one that BitBucket knows about for you … probably the one that you used to register. If that went as expected, then you have connected to the git server using SSH, but you haven't really done anything useful with it yet. If you don't have a repository that you can clone for testing, then feel free to run that command. It is a public repo that has a script that I wrote to solve a problem. The README is longer than the script, but hey! What do you want for nothing? Of course you can't push changes back up, but you get the idea. If it worked, then congrats. 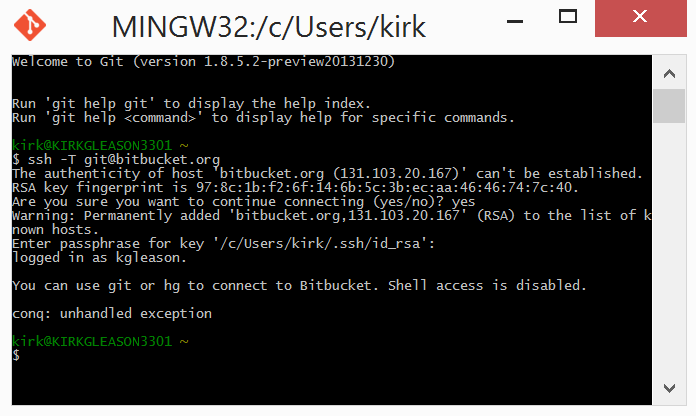 You have configured windows to work with BitBucket via SSH. 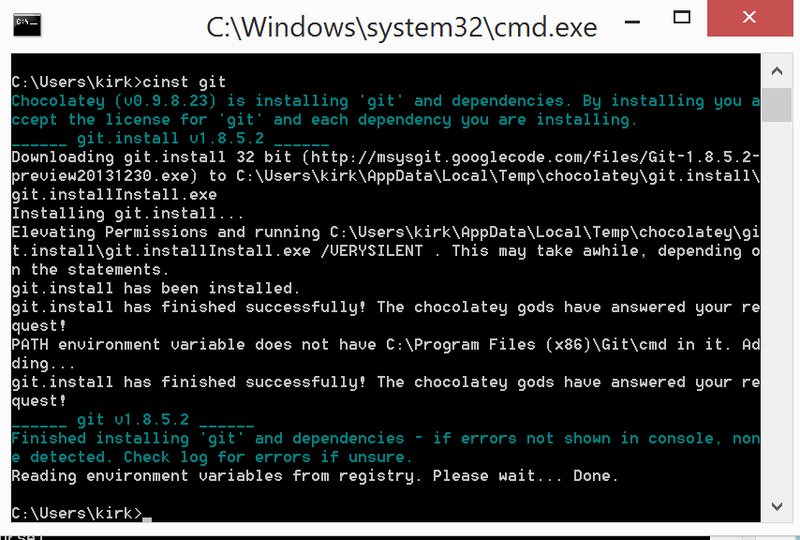 Any GUI tools that you may install that use the git executable that chocolatey installed should automatically have access to your key. If you don't believe me, then go to Start --> All Programs --> Git --> Git GUI and have a go. It should work. So there you have it. Next time out, I'll throw out some tidbits about pimping out your git-bash setup, and how to stop getting prompted all the damned time for your SSH passphrase.